New Sting Album, 'Symphonicities', to be Released this Summer on Deutsche Grammophon. First Single, "Every Little Thing She Does Is Magic" to be Released Digitally on Monday 24th May. Live Nation announced today that Sting, accompanied by the Royal Philharmonic Concert Orchestra, will extend his world tour to Europe and the UK this autumn. The 'Symphonicity' tour, commencing in Vancouver on June 2, followed by sold-out performances across North America throughout the summer, will find Sting performing his most celebrated songs re-imagined for symphonic arrangement. The Royal Philharmonic Concert Orchestra will be conducted by Maestro Steven Mercurio (Pavarotti, Bocelli). Presented in a variety of settings, the European tour will begin September 3 at Oslo's Konserthus followed by a September 5 performance at the Royal Theatre in Copenhagen. On October 5, Sting, accompanied by the Northern Sinfonia Orchestra, will perform a special concert at the Sage Hall in his hometown of Newcastle, England. Also announced today are performances at other prestigious venues such as London's Royal Albert Hall on October 1, Teatro Verdi in Florence on October 25, Teatro Arcimboldi in Milan on November 2, and Santa Cecilia in Rome on November 10. Additionally, September will find the tour making stops in Stockholm, Helsinki, Berlin, Koln and Paris, followed by concerts in Dublin, Nantes, Antwerp, Hamburg, Frankfurt and Stuttgart throughout October, with additional performances in Turin and Vienna in November. On sale times are 10am (Local) except were indicated at * which will be at 9am (Local). * The Sage Gateshead performance features Northern Sinfonia Orchestra. 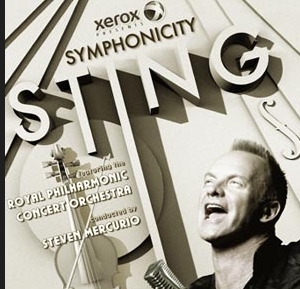 ** Sting headlines Arnhem's annual Symphonica In Rosso concert series.